We are a group of well-wishers trained in engineering and the sciences. We understand that the EVM challenge has been initiated by the Election Commission as a response to allegations that the recent elections were rigged. From a technical perspective, such allegations are best addressed by auditing VVPAT records where they exist. The EC could, however, use this challenge as an opportunity to increase electoral process transparency. Additionally, independent of the outcome of the challenge, the EC should check the outcome of each election by creating, maintaining and auditing VVPAT records. The issue of EVM security is not a political one, but a technical one. From a technical perspective, to understand what kind of tampering is possible, actions that might be performed by an insider in the process, or a criminal, should be allowed during the challenge. In the event that the EC prevents some type of access, (it disallowed physical tampering in 2009) it should explain why an insider or a criminal would not have that kind of access. Individuals should be allowed to choose their instruments and to physically tamper with an EVM. They should be provided design documents and test descriptions and results, as well as information about the security procedures in place, for each generation of EVM currently in use. The results obtained by each team examining the EVMs should be made public. Longer term testing by a team with in-depth expertise in computer security and voting system security should be performed, and its results be similarly made public, in the manner of theTop-To-Bottom-Review ordered by the Secretary of State of California, USA, in 2007. A team of experts should be tasked with preparing recommendations to address each important security vulnerability discovered during the challenge and the longer term testing; their report and the decisions of the EC regarding timeline for addressing each issue should be made public. The process should be open, and comments from external experts should be solicited. The EC should note that it is virtually impossible, whatever the qualification of the individual examining the EVM, to determine with certainty that EVMs are tamper-proof. Electronic devices can be designed to detect when they are being tested, and it is practically impossible to test for every possible configuration and scenario. Hence, if the EVM challenge does not detect a problem, this does not mean that election outcomes are guaranteed to be secure in the future; regular VVPAT audits can help address this issue. As engineers and scientists, we know that an electronic device, such as the EVM, is not transparent to the human voter. As such, the human voter does not know whether his or her vote was recorded or counted correctly. Further, our experience and education indicates to us that machine errors and human error in the processes of design, testing and deployment can result in an incorrect output.Electronic devices cannot be guaranteed to be immune from tampering when there is a large number of insiders with access and non-insiders with mal-intent, attempting to subvert the device’s functioning. These include everyone who may have access to the EVM over the cycle of design, manufacture, testing, storage, maintenance, calibration and deployment. The Indian EVM is interesting from a design perspective because it is a single-purpose device, unlike most other voting machines developed elsewhere, and its functionality is achieved through a combination of hardware and firmware. The prescribed process for its use does not require wireless communication and it is not fitted with hardware to enable such communication. Thus, it is not immediately vulnerable to exactly the same attacks that work on other voting machines. However, the design by itself is not sufficient to protect the EVM from tampering or error. A general class of vulnerabilities is common to both the Western machines and the EVM. These vulnerabilities arise because of the difficulty of determining exactly what a given electronic machine will do in every scenario, and because those with physical access can change and probe aspects of the hardware or software (for example, they can fit the machine with a wireless receiver, swap out a ROM, or determine the key used to provide cryptographic security). While the EC has announced several times that it believes that the EVM is tamper-proof because of certain design aspects, there has been no release of any detailed information about these design features. As a result, there is no clarity regarding EVM security. The EVM Challenge, beginning on 1 May 2017, should be treated as a means through which voters and the public in the world’s largest democracy may understand the security strengths and weaknesses of their voting technology. It would be a waste of time and energy if the EVM Challenge is executed as a superficial exercise without full access and transparency. Our recommendations for enabling transparency in the process are listed in the main body of this letter. Independent of the outcome of the EVM Challenge, the EC should enable the creation of VVPAT records, ensure their secure storage separate from the EVMs, and conduct regular VVPAT audits for each election. It is heartening to note that funding for VVPAT capabilities was recently approved by the Cabinet after persistent requests from the EC. The creation of the VVPAT records is not sufficient, however; the records for each election should be audited. Audits involve the examination of a randomly-chosen subset of the VVPAT records and are, generally, much more efficient than a full hand count. The EC has a well-deserved excellent reputation worldwide. It successfully carries out elections in a very challenging environment: with a large number of voters over diverse geography, climate, literacy and culture, making extraordinary efforts to be inclusive of all voters. We hope that the EC will keep up the positive momentum and conduct a genuinely open and substantial EVM Challenge so that voters may understand better the capabilities and limitations of their voting technology. This can only enhance the trustworthiness of our elections and the vibrant nature of Indian democracy. Note that affiliations below are included for identification purposes only and do not reflect the view of the signatories’ employers or collaborators. Those names marked with an asterisk were added after the letter was sent to the EC. One of my most awaited movie is releasing today. Jessica lal case really showcases the complicated intricacies of crime, power, media & politics. Hope to watch the movie soon & then would probably post about my thoughts on the movie (in line with my new year’s resolution to post more blogs). Arundhati Roy , one of my favorite writers & booker award winner for her first book, is in news this week about her statement about Kashmir not essentially an “Integral” part of India & there is a huge uproar that she be booked (along with Geelani) for sedition again India. This is ridiculous to think that if India really wants to be India & not afganistan & pakistan. Moreover the timing of this is completely political. You can see her interview for 1 and a 1/2 year back & there is nothing different that she is saying now. 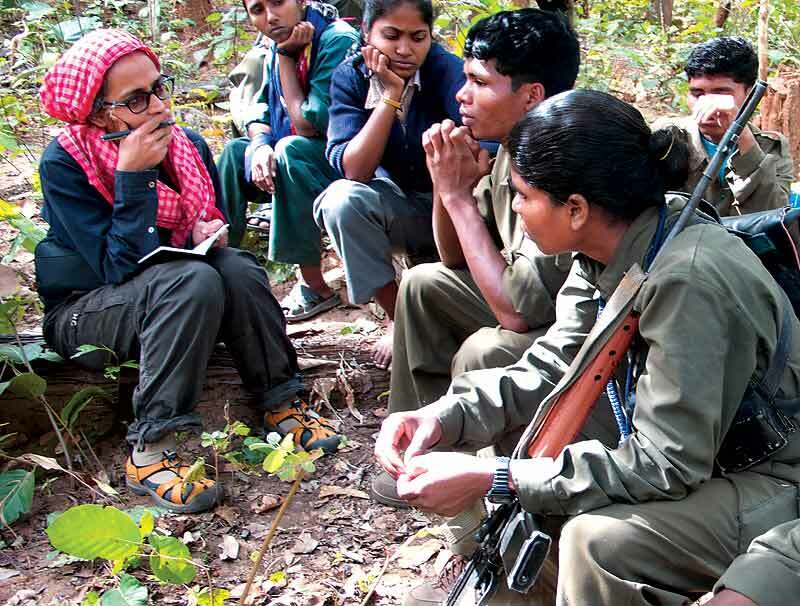 As always Arundhati Roy writes a really thought provoking narrate of her interview with Naxalites in Dantewada (yeah, where 70+ security personnel were gunned down by naxals earlier this month). Published in the Outlook magazine, on March 25th, it is a great essay about tribal suppression by their own government & then of tribal uprising. Arundhari, minces no words in this highly thought provoking essay. There are many ways to describe Dantewada. It’s an oxymoron. It’s a border town smack in the heart of India. It’s the epicentre of a war. It’s an upside down, inside out town. 10 people die every day on the train tracks in Bombay – that is over 3,600 people every year are killed by an uncaring government entity. That is terrorism of the bureaucracy. There is one farmer committing suicide every 30 minutes in India; over 50 every day. There have been 150,000 suicides by farmers in India between 1997 and 2005. One out of every five farmers is from the state of Maharashtra. That is terrorism by the government. 8 people have died every day in Kashmir for the past 18 years. That is 6,570 days of terror in Kashmir. Bombay had its 60 hours of terror; Kashmir has had 157,680 hours of terror – and still counting. Not to downplay the terror attacks in Mumbai in anyway, this articles highlights the rampant political & government corruption in India and the reasons why such terror incidents keep happening again & again.